Jeff is injured and needs your help! On July 27, 2013, Jeff Sachs was enjoying a day at the beach with his family when he suffered a severe spinal cord injury. Jeff dove into the waves from the shore, hit a sandbar, and fractured his C4 vertebra. He immediately lost all feeling and could not move his body below his neck. His wife and friends pulled him from the water while his four-year-old daughter looked on from shore. In the week following the accident, Jeff underwent two surgeries to stabilize his neck. He was transferred to a rehabilitation center where he completed several weeks of therapy, then had an additional surgery on his tailbone to repair a stage four pressure ulcer.He spent nearly 7 months in the hospital, and is now home with his family. At this time, Jeff breathes with the aid of a ventilator, has no movement in his arms or legs, and has limited movement in his shoulders. Jeff is a 40-year-old, active, funny guy who loves his wife, Kristen, and daughter, Evie, more than anything in the world. This injury has changed the Sachs family’s lives in almost every way imaginable, yet Jeff’s spirit remains intact. He and Kristen are devoted to each other and to facing their new life together with love, courage, and grace. Through hard work, intense rehabilitation, and support from his friends and family, Jeff is determined to maximize his recovery and rebuild his life. Jeff’s family needs assistance to help cover the costs for Jeff’s continued recovery and new way of life. Insurance will cover some of their expenses, but costs such as vehicle and home modifications, specialized medical equipment, and caregiver fees will be out-of-pocket expenses the Sachs family will have to make on their own. To help with these costs, a fundraising campaign in Jeff’s honor has been established with Help Hope Live, a nonprofit organization that has been assisting the transplant community for 30 years. In 2000, they expanded their mission to include those who have sustained a catastrophic injury. All contributions are tax-deductible to the full extent allowed by law, are held by Help Hope Live in the Southwest Spinal Cord Injury Fund, and are administered by Help Hope Live for injury-related expenses only. 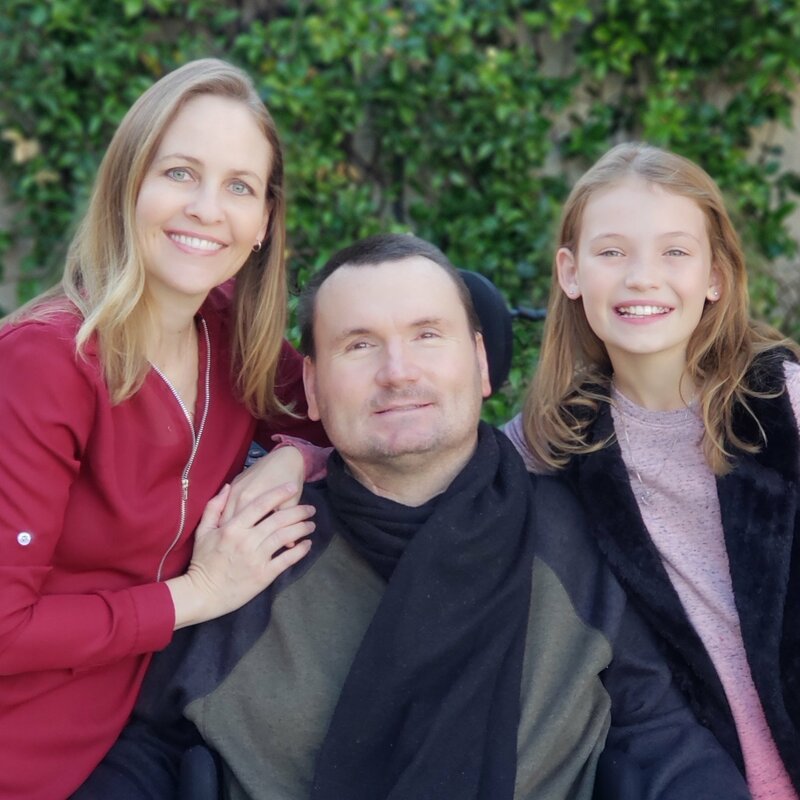 Please consider helping Jeff make the best recovery possible by contributing to his Help Hope Live fundraising campaign. Your donation is greatly appreciated. Wishing everyone a very happy holiday season! We continue to blessed by your support and contributions. Please be sure to check our blog and Facebook page for frequent updates! Remember to visit our blog for updates on our family! We continue to be so thankful for the support and love that’s been shown to us. Your donations, prayers, kind words, and positive thoughts have helped us tremendously. Thanks to all of the donations you’ve given us over the past several months, we were able to purchase a modified van. We are beyond excited about what this means for our family! We want you all to know how much your donations have meant to us. Please know that we are touched beyond words at your generosity. I plan to update this website still, so don’t worry! I also want to send a thank you out to everyone who has donated to our cause. Jeff and I are amazed at your generosity and are so grateful for your help. When I view the list of donors, I am blown away by those of you who donate on a continual basis. Many of you are people we haven’t even met. Please know that your actions mean so very much to us. Now that Jeff is home, we are discovering the beginning of the financial challenges that come along with a spinal cord injury. Sometimes we find ourselves lost in thought wondering how we are ever going to afford it all. The stress is difficult to bear at times. But your donations have helped to ease the pain, and have given us peace of mind knowing that one of our goals is within reach … the purchase of a modified van! We hope to have a van within a month, and we could not do this without your help. So again, thank you for your donations, your prayers, your thoughts, and your love. Today was a milestone day. It was Jeff’s first time in a car since the accident (ambulance rides don’t count). He had his first in-person doctor appointment, so we rented a van through our caregiving company, and I accompanied him. We were both anxious about the ride and navigating a visit to the doctor in his chair. It turned out to be a great trip, and we had such a feeling of accomplishment when we got home. I literally packed a small rolling suit case with items we “might need” – just in case. Jeff was making fun of me saying if I could have strapped his bed onto the top of the van, I would have. Ha ha. We were both wondering if Jeff would feel carsick from the movement of the van since he hasn’t been in a vehicle in almost 10 months. Luckily, he didn’t feel sick. He only said his neck was sore afterward from the motion in the car. We drove down PCH on this beautiful SoCal afternoon. We drove right by where his injury occurred. We talked about how the last time we were here, we were in an ambulance on the way to a hospital, terrified out of our minds. We were quiet for a bit as we drove by the stretch of beach that changed our lives, but as we got further away from it, we turned our minds and conversation to the future. The doctor visit went without a hitch, and we were soon back in the van enjoying the scenery on the way home. We were only gone two hours, but those two hours were huge steps for us. Jeff talked about how good it felt to get out – better than he thought it was going to. And how much he is looking forward to getting our own van so we can go places as a family – out to dinner, to the park, to visit friends. Much thanks and love to everyone who continues to support our family. Please read this beautifully written account from our dear friend Norieh about her recent visit to California which included a visit to our home. Norieh has been a Team Sachs leader since the day of Jeff’s accident. We are blessed to have her in our lives. This past month my family and I came to California for a visit. It had been almost 2 years since my last visit and one of the things I absolutely wanted to do was to see Jeff and Kristen. I had hoped the big guy would be up for even a quick visit, and I coordinated with Kristen. I was nervous and anxious to see Jeff. I didn’t know what to expect. I didn’t know how I would react. Jeff Sachs is bigger than life. He’s funny and he jokes around and he gives you a hard time. I didn’t know if he was still all of those things, I didn’t know if I would see him and turn in a puddle of tears. Kristen opened the door and immediately gave me the biggest tightest hug. I really didn’t want to let her go. This 5 ft 4, 100 lb little thing, who as it turns out, is the strongest, toughest person I have ever known, just exuded with warmth. With all that she had been through this past year, she looked just as pretty as ever. She was just bright with ﬁerceness and hope. You could see it. In fact their entire home felt that way. The one story house was bright and airy and you could feel the ocean breeze coming through from a couple of miles away. It was the perfect setting for someone to work on recovering from such an emotional and physical injury. The space, it seems, was almost tailor made for this family with their new lives and new challenges. Jeff ’s new chair had enough space to move around in the house and even the kitchen was open for him to be able to sit with the family for meals. Jeff, Kristen and I sat and caught up. I kept asking questions, they kept answering, we laughed, we shared some gossip. We talked about the future, about the plans for recovery, the little goals that are actually huge steps towards a more comfortable life for Jeff. Jeff, never missing an opportunity to bust my chops and poke fun. He’s as quick witted as ever. He hasn’t changed. He’s still him. He’s still sarcastic, bigger than life, he still makes jokes, he still smiles. He is still the Jeff we all know and love. While we were all talking I noticed Jeff and Kristen. The way they spoke, the way they ﬂowed together when telling a story.. The ﬂuidity by which they interacted was something I had never seen before between two people.. It was like they were one person. The way he still makes her laugh, big, whole hearted belly laughs. The way she knew what he needed before he even said anything, and walked up to him to give him a drink. They looked at each other and I swear the thought came into my head that I have never known two people to be closer than Jeff and Kristen at that exact moment. Jeff has said that since he has been home he feels mentally and physically stronger. Being home with his family has contributed tremendously to the way he feels. It hasn’t even been a year since Jeffs accident. There is still so much more to plan for. To prepare for. To hope for. 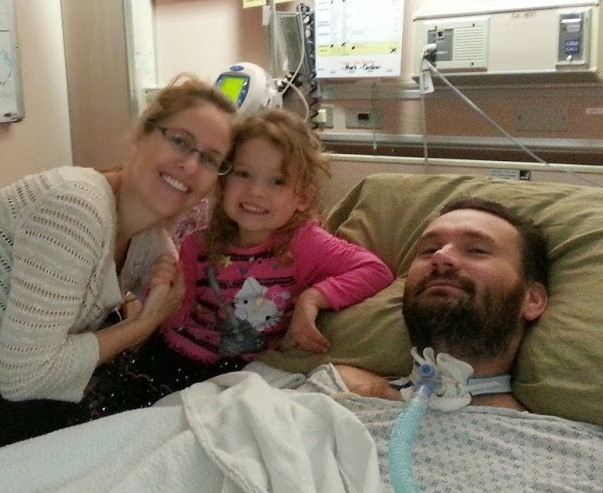 Medically the outcome is yet unknown and Jeff and Kristen both live in an optimistic reality. They are preparing for anything and everything that may come their way. They are not done ﬁghting. Kristen is calm and determined, researching and focused on the next thing on their to do list for recovery. In addition she is a wife, a mother, and technically a nurse at this point since she can do anything a medical professional can do by now. Evie is doing what Evie does which is bring light and love into the room. With as young as she is she seems to understand clearly what is happening to her Daddy and has been adjusting to it with a grace beyond her years. When she dances for her family she tells her Daddy to clap by making Popping noises with his mouth. There are physical goals to reach. Research to be done. Equipment to be obtained in order to allow Jeff to receive the best medical attention for his recovery (ie: Specialized Van for transporting to and from the doctors ofﬁces). I cannot tell you how grateful I was to spend some time with this family. How inspired I was. How happy I was to see my old friend. There is still much left to do. And there is still much hope to have. It’s been too long since I’ve posted an update. I know many of you often check the website for updates, and I apologize for not posting any since Jeff’s been home! Our days are filled to the brim with things to do, calls to make, research to perform, etc. especially now that I am back at work. But through all of the chaos of the day, each night we are just grateful to have Jeff home. Happy that he and Evie can be together once again and develop new ways to play together. Happy that I can sleep next to my husband again at night (even if it is on an inflatable mattress next to his bed). Overall, Jeff has been feeling well since he’s been home. He received his custom power chair last week, and he loves it. It’s very comfortable for him, and gives him a level of independence he didn’t have with the manual chair. We were also excited this week for Jeff to receive Google Glass! He is part of the Google Glass Explorer program where he is one of the first people to test the product and provide feedback before it is available to the general public. We are hoping that it will further his independence. A few weeks ago, we got Jeff back online. He uses a mouthstick and voice commands to control his phone, and he’s been texting and browsing the Internet almost every day. We have recently begun researching other voice controlled electronics, and are still searching for a way for Jeff to operate the TV using his voice. Time Warner, our cable provider, doesn’t have voice controlled options, so I’m going to inquire with DirecTV soon. If anyone knows of products that might help, we would love to hear from you. We’ve also just begun to research things like stem cell treatment/surgery and physical therapy gyms that focus on helping people living with SCI. Those things will likely fall into place a little further down the line. There are other things to accomplish first (like getting a modified van) that require our immediate attention and research. I wish there were more hours in the day to get caught up on everything we need to know about this new life. One day at a time, though. We continue to be thankful to everyone who has supported us throughout this journey. We love to hear from you, so keep the love coming! Jeff has been home for a little over a month now and is adjusting very well. He is feeling good, eating good, and sleeping better than he has since the accident. Evie loves having her daddy there and climbs in his bed with him taking along her books and toys. They are both beaming with joy being together under one roof again. Kristen is an absolutely incredible caregiver and has Jeff’s care running very smoothly. It continues to be so inspiring seeing the strong bond and love they share and how they face each day with such grace and optimism. Please continue to keep them in your thoughts and prayers as they continue on this journey one day at a time. Thanks for all your continued support and encouragement. Please check out the below CHARMS & WRISTBAND sale link and show your support! All money will go to HelpHOPELive to help assist with Jeff’s medical expenses. Yesterday was a huge day for the Sachs family as Jeff finally came home! It was a thrilling and exhausting day for Jeff and Kristen and Evie is SO excited to have her daddy home. More details to follow as they get settled. Thank you for your continued love and prayers. It has helped them come so far! Last week was a rough one for Jeff as he battled pneumonia and food poisoning. Thankfully, the doctors took good care of him and he is now feeling much better and getting back to his therapy. The final details with his home health nursing visits appear to be resolved and we are cautiously optimistic that he could be home by the end of the week! Please continue sending prayers and good thoughts his way! I just spent 5 wonderful days with Jeff, Kristen and Evie. It was amazing to see how far Jeff had come since my visit two months ago. He is so much stronger, both physically and mentally. He looks and feels good, is joking with his caregivers and is anxious to come home. There are a few final details pending, but we are hopeful he will be home within the next week. Jeff has come so far in the 6 months since his accident and we are all so proud of him. Please continue to keep him, Kristen and Evie in your thoughts and prayers as they take this next step in their journey to be under one roof together and adjust to their new lives. Thank you for your continued love and support. Your many kindnesses have made such a difference to our family. Apparently hospital discharges take much longer than anticipated. Jeff’s discharged is yet again delayed. We have begun receiving equipment at our new home, but we still haven’t gotten everything yet. It is certainly better to make sure that we are completely prepared for Jeff to come home rather than rush things, but Jeff has a major case of cabin fever, and is going a little nuts having to be in the hospital this long. It’s been almost 6 months, and he is very homesick. We have been busy getting our new home ready for the big homecoming. My mom will be moving in with us in the coming weeks, and pretty soon, we will all be settled in. We can’t wait for that day. We simply cannot send enough thanks to all of the people who have helped us along this journey. The donations continue to come in, and we are consistently reminded of the good that is in this world. We are also thankful for the meals, kind words, good friends, and loving family that fill our lives. A few days ago, I chatted with a friend I’d met at Rancho – a wife of a quadriplegic. Rosa’s husband, Jose, has been a quadriplegic for 41 years. She has shared stories of success with me and Jeff, and has showed us that life is possible after a spinal cord injury. During our talk, she told me something that has resonated with me. She said, “This life is difficult, but not impossible.” There’s no denying that our life will be more challenging than it was before. But I truly believe that in many, many ways, it will be even more rewarding. There’s been a delay in Jeff coming home because we don’t have any supplies yet from insurance. Fingers crossed that we’ll get everything we need soon so Jeff can come home. Just a quick update … We recently learned that Jeff will be coming home on January 6! We are so excited that he will finally be with us in the same house so that we can feel like a family again. Today (December 27) marks five months since Jeff’s injury. In many ways, the time has gone by so quickly, but in other ways, it’s as if time has slowed down. When we look at the situation and life that we’ve had to live for the last five months, it’s hard to describe accurately. The amount of change we are faced with is certainly overwhelming, and some days it seems like we are never going to be able to function in this new life. On the other hand, the change has also brought us closer, and has most definitely made us stronger. We have much to accomplish in the days before Jeff comes home. But the whirlwind of preparations will pay off once we are all sleeping under the same roof again. Much love and thanks to everyone who continues to support us. We have a new YouTube video! Please watch, post to your Facebook page and share with everyone you know! This Thanksgiving is certainly very different from any other we’ve had, yet we still have so much to be thankful for this year. Jeff’s parents spent the day with him watching football, then Evie and I spent time with Daddy in the evening. Jeff ate my mom’s chili for dinner (yes, we had chili for Thanksgiving this year! ), then we all three had cake for dessert. Yum. This year I am more thankful than ever for my family. I am thankful that I still have my husband, and through an unfathomable twist of fate, we have the opportunity to build a new life and continue to be the best parents we can to our precious daughter. I am thankful for my daughter who has handled the changes in her young life with remarkable resilience. She has a big heart, a sweet disposition, and a silly side that keeps us smiling even through hard times. I am also thankful for my extended family and friends who continually support us in so many ways. I am thankful to my coworkers who have generously donated their vacation time so that I can be by Jeff’s side and work to get our life back on track. I am thankful to strangers who have helped in countless ways and who have reminded me that this world is indeed full of compassionate, caring people. So despite the struggles we’ve been through these last several months, there is still so much to be thankful for. Please sign up to take Kristen and family a meal! Thank you all for your generosity!!! Welcome to our new website! We are very excited to partner with HelpHOPELive as we continue this journey one day at a time and try to share Jeff’s story with as many people as possible. Please share this page with family and friends. Please sign the guestbook with messages for Jeff and Kristen. And please consider a contribution to his fundraising campaign. Thank you for your continued prayers and support. Thinking of the Sachs family today. Thinking of the Sachs family today. We love you. Sidney took the ALS ice bucket challenge and we thought of another donation we'd like to make :) We're always thinking of your family and love keeping up with your blog! Hugs! God Bless. Hope you get better as each day passes by. Glad you are finally home. Stay strong! You are in my thoughts and prayers. Kristen & Jeff, Just wanted you to know that you are in our thoughts and prayers every day. As we all know, life can throw us curve balls and all we can do is keep faith and do the best we can. We can see you are doing just that and the love you have for each other is very evident. We hope someday to come by for a visit whenever you are ready, please let us know. Your family has been part of our family for many years and we love you all soooo much! Kristen: Next Step Fitness is the place that my neighbor referred you to as well...it's a sign! Thinking of Jeff, Kristen, and Evie. We love you. Hi Sach's family. I just read about the visit you had from Norieh. What wonderful uplifting news she provided us with. I know you have a long road ahead of you, but you are all so strong and doing all the right things. I think of you every day and you are in my prayers. Keep smiling and keep the love flowing. May God Bless you all and make your burden lighter. Love to all. We miss seeing you guys!!!! Hi Jeff & Kristen, You've been my thoughts and prayers many, many times over this last year and will continue to be. I'm very happy to hear you're at home. Just thinking of you cuz. Glad you are home finally. I just figured out that there was a new website and am glad to see the updates. Stay strong and the Las Vegas Sachs' are thinking of you. Not a day goes by here that we dont miss our Sach's! Just wanted to let you guys know we are thinking of you! Love the picture and great to hear how well things are going. Thinking of you! Jeff - I'm so glad to hear that you're home!! We really miss you here at the office so I can just imagine how much Evie and Kristen missed you at home. I'm continually praying for you, your recovery and your family. I hope to see you soon. I'm so glad to hear you made it home, buddy! It's wonderful that you're all under one roof. We all miss you and wish you all the best. Welcome home Jeff! Let us know when you're ready for visitors. Love you guys! You're home! We are so happy to hear that! Hooray! Glad to hear you are home. I can't wait to visit. I hope to see you soon. Sending out happy healthy positive thoughts to the Sachs family. You are always on our minds. Jeff your story is just beginning and your next chapter will be exciting just wait ! Take good Care!! You are all in our hearts. Sending you prayers and support. Great seeing you on Saturday! Continued thoughts and prayers coming your way every day! I'm wearing my Team Sachs necklace today...holler! 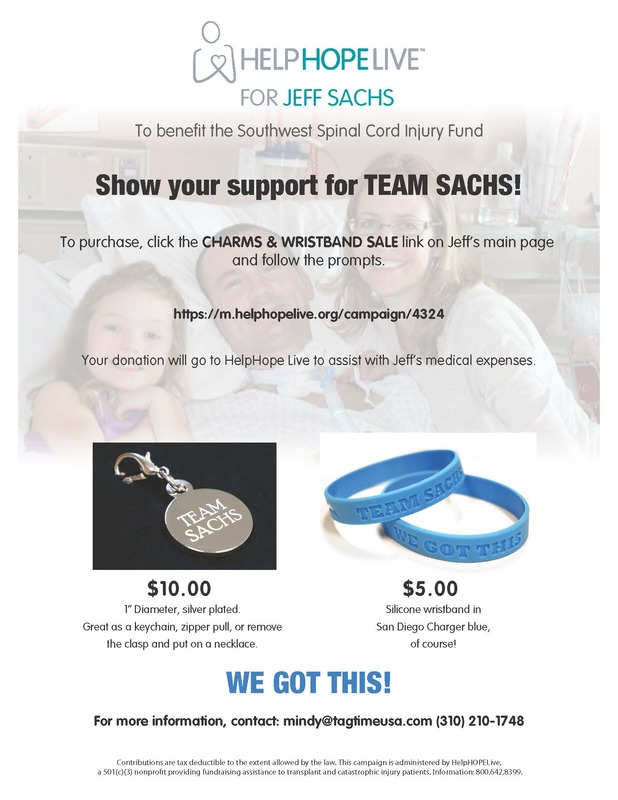 Looking forward to Jeff's release so we can all hang out together :) And for all you supporters...Team Sachs charms and bracelets soon to be hitting this webpage...check back in a few weeks. You have been on our mind. Please let us know if we can help in any way. Lifting you both up to good things. I hope you get home soon buddy. Jeff, I sure hope that you can get home to feel the sun on your own porch and get hugs from Evie any time, day or night. By the way, there is nothing like feeling the sun when it's been a while since you have! Enjoy! Jeff, I want you to know I am praying for you and your family. I don't mean this as just a platitude,but as an intense,fervent intention to bring you and your family before God for His Help in every way. My heart is with you and your family. I saw Jeff on Friday. He told me how incredible it was to get in the motorized chair and drive it outside to feel the sun on his face for the first time in over 5 months. Such a positive step forward - mobility! Love you Jeff. 2014 is going to be a whole new adventure! Here's to a smooth transition to home life. "The explorations of Science continues to uncover Gods Great Wisdoms..." "Just because it's never been done doesn't mean it can't be..." "Don't let your travels end before they begin...allow one step at a time..." There is a 'fix' for this injury soon on the horizon. Right now healthy psychological healing is most important...relax, recover, renew, rejuvenate. May Hope, Faith, and Love be the foundation for your future. Many blessings of strength to you and your family. Team Sachs you are an inspiration to us all! Thank you for showing us daily the fruit of the spirit, love, joy peace, patience, kindness, goodness, faithfulness, gentelness, self control. You are an amazing family and we are with you on your journey! Enter a note of encouragement here.We want you to know you are in our thoughts and prayers every day! Hi Sachs, We think about you guys everyday. Keep your spirits high and always have a great attitude. Expect great things to happen and they will. Love, Nashville Carr's. Happy Thanksgiving! We want to give thanks for the amazing example of strength and love that Jeff, Kristen, and Evie have shown the past 4 months. Truly inspiring! Love this new website. This site is going to go a long way towards helping the Sachs family cause. Keep up the great work! Happy Thanksgiving to the Sachs family. You are always in our thoughts. Hugs and kisses to everyone on Team Sachs! Jeff, Kristen and Evie! Love the new site. We think of you often! I loved my week there with the three of you and continue to be amazed by Jeff's spirit and strength. The love and courage you share is so inspiring. We love you.